Private islands may be the ultimate luxury, but for those for whom the prestige isn’t quite enough, there is another way to make your mark – why not carve your name into your island so that even passing spacecraft can see it? 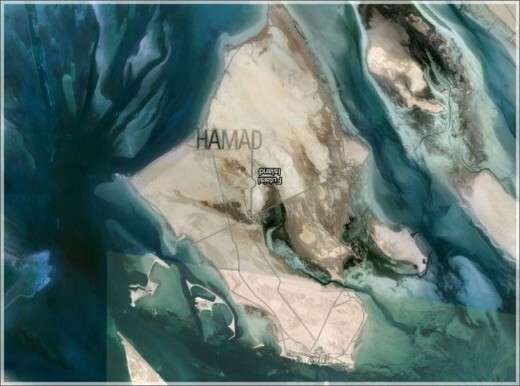 That is exactly what Sheikh Hamad bin Hamdan al Nahyan, a member of Abu Dhabi’s ruling family, has done on the sandy edge of his private island and a famed tourist destination, al Futaisi, a sprawling Persian Gulf isle more than 50km square. Found right off the coast of Abu Dhabi, it’s amazing that al Nayan’s unusual accomplishment has not been widely noticed until now, more than two years after it was created. 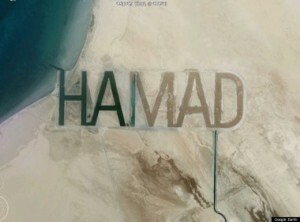 The letters, which likely took an enormous amount of manpower to create, are roughly half a mile high, and the name “HAMAD” totals just over a mile long, making his work visible from space. Connecting to the sea and dug deep into the island’s sandy soil, the letters, rather than washing away like a sandcastle in the tide, have actually become channels that are partially filled with water. In fact, the Sheikh is reported to use them as a place to race his many speedboats. Elsewhere on the island, there are stables filled with Arabian horses, a replica military fort, a golf course and country club, and numerous well-appointed chalets for rental. Known as the “Rainbow Sheikh”, al Nayan has become rather famous for his numerous extravagances; he has built one of the largest car collections in the world at over 200 cars and trucks, many customized with amenities like televisions, gun racks, and on the top of one military vehicle, even a putting green. The Sheikh stores them in a vast pyramid-style museum that is open to the public. Most notably, he created the world’s largest truck, a 5-metre high Dodge Charger that contains a four-bedroom suite. Sitting outside of his Emirates National Auto Museum is an even more incredible feat, an accurate one-millionth scale replica of the Earth. It isn’t surprising then, that he chose to write his name in the sand in a most unforgettable way – the only question that remains is: what’s next for the Rainbow Sheikh?